That was a brazen exhibition of political charlatanry Peter Robinson and Martin McGuinness presented to the public last Thursday. You know the old saw, ‘It may be all right in practice but it will never work in theory’? Even that paradox doesn’t apply to the snow job those two guys dumped on people last week. Initially they got away with it too because the media were cautious about rubbishing proposals for healing divisions in the north and were anxious to give Robinson and McGuinness a fair wind. There were enough concrete proposals to produce good headlines. They didn’t deserve them. Essentially you were looking at a giant grant application. One DUP bagman said it would all cost half a billion pounds. Where pray would that come from? By a strange coincidence in recent weeks our proconsul has been regularly telling these guys that if they produce the goods there is money to buy them. It is urgent because the Irish presidency of the EU ends in July so they had to get their act together before then to benefit from EU largesse. Obama’s coming so there’s likely to be a US input too. Must rush. Thus the suspiciously round figures: 10 this, 100 that and 10,000 the other. You can bet when they wrap the costs round these, bingo, they will come pretty close to, guess what, half a billion. None of it was new. Much had already appeared in previous documents, long forgotten, gathering dust. The only difference was the size had been multiplied because there’s more cash available. Oh, and the interface walls? Gone in 10 years, of course, not nine or 11. The dynamic duo needn’t worry. Neither of them will be in office in 2023. And here’s the rub - none of it will make a blind bit of difference because none of it is based on any theory never mind a policy. These two guys share no point of principle, no view of the future. They pursue diametrically opposed goals. Sinn Fein is presently launching its campaign for a border poll. The DUP fondly imagines a day Catholics (not nationalists) will vote for the DUP. Hence any matter that requires a common view or a single policy, like recognising and promoting diversity in this society, which means dealing with flags, emblems and parades, the Irish language, and crucially the legacy of 40 years of violence, falls by the wayside. All previous attempts, half-hearted though they were, since Sinn Fein and the DUP came together in 2008 have failed. They gave commitments at Hillsborough in 2010 which crashed by the autumn. Cohesion, Sharing and Integration are dead because both parties fear assimilation is the other’s goal. They cannot agree on anything important so they have hived off anything important to an all-party committee, which of course has no power, any more than the committee that fell on its face in 2010 with laughable proposals on parades. While millions are to be allocated over years to promises of urban villages, shared housing and a new Youth Employment Scheme, there is nothing for the problems that will rear their ugly heads again this summer as ever. 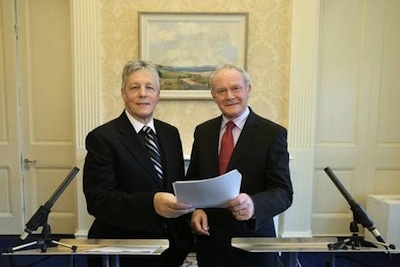 There will be more details in the coming weeks about how many years the money will be spread over when the poor civil servants have put flesh on last Thursday’s bare bones, but what really matters will be ignored because Robinson and McGuinness cannot agree a course of action. What last Thursday’s con-trick displayed was not the ‘most ambitious’ plan as Robinson claimed but a colossal failure by the DUP and Sinn Fein after five years of stalemate. People used to mock John Hume’s ‘Humespeak’ but at least it was evidence he was operating from a theoretical base, which the Irish and British governments came to accept. Last Thursday showed that Robinson and McGuinness haven’t got a single agreed concept never mind a workable theory about what this place should look like or how society here should function. Their failure to cope in practice with serious matters was evident this year. Last week as they tried to pull the wool over people’s eyes it was the police in desperation trying to take the lead in the absence of political leadership.